Baltimore, MD – June 11, 2016 – Digital health technology leader WellDoc® today announced results from a real-world study designed to evaluate the feasibility and reach of using a lay coach in conjunction with BlueStar® mobile prescription therapy to provide ongoing self-management support for people living with type 2 diabetes in a primary care setting. The data were featured via a poster presented today at the American Diabetes Association’s (ADA) 76th Scientific Sessions, taking place now at the Ernest N. Morial Convention Center in New Orleans, Louisiana. On March 24, 2016, the Shanghai Eighth People’s Hospital hosted a Chinese nationwide continuing education conference focused around two topics: Shanghai Diabetes Prevention and Treatment Service System – Regional Hospital Cooperation Projects and Shanghai Integration Model of Diabetes Management. This meeting will play a formative role in the development of a regional diabetes prevention and treatment service system in Shanghai’s Xuhui district, and the implementation of a diabetes management project in the area to improve the health outcomes of community residents and urban public health security. On February 9th, Nesta hosted a one-day conference to explore the digital and social innovations happening in health and healthcare. 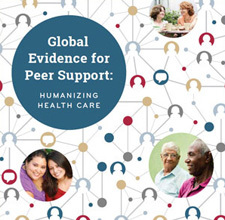 Ed Fisher, global director of Peers for Progress, was invited to speak about peer support as a global strategy to improve health and well-being. Behavioural Change in Future Health and Care Systems: The Future of People Powered Health from Nesta UK on Vimeo.